I was a 20 year old college kid working a grindingly-boring Sunday afternoon shift at KQDJ Radio in Jamestown, ND on February 13, 1983. I was doing what I usually did on those boring Sunday shifts; playing records, doing homework, taking transmitter readings. Then, the police scanner in the “newsroom” next door, which normally burbled with the desultory reports of DWIs and bar fights and traffic stops that make up the lives of most small town cops, suddenly erupted. There’d been a shootout; officers were down; cops and sheriff’s deputies were being dispatched to Medina, a town of about 400 people about 35 miles west of Jamestown on I94. 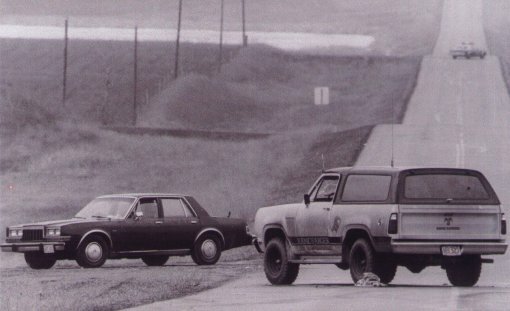 It took hours to untangle the story, which became perhaps the most famous crime in North Dakota history, the Medina Shootout. Two US Marshals, dispatched from Fargo to try to arrest a group of tax-protesters affiliated with the neo-Nazi-sympathetic “Posse Comitatus”, had been killed in the shootout that ensued. Their leader, Gordon Kahl, and several others fled the scene. The scanner reported ambulances on their way to the hospital in Jamestown bringing the wounded, which included Yorie Kahl, criticially injured by a gunshot; in one of the many ironies that day, Kahl’s life was saved by the doctor on duty in the Emergency Room that day, Dr. Evan Kostick, father of my high school pal David (himself a doctor today), and one of Jamestown’s tiny Jewish community. News organizations in North Dakota today are remembering the 25th anniversary of the shootout – the Fargo Forum led and leads the coverage; others from the Bismark Trib pitched in; former Forum staffer James Corcoran wrote “Bitter Harvest”, the definitive book on the event, relating not only the shootout and the apocalyptic trial of the survivors, but the social sturm und drang that the event caused on the Northern Plains. Times were brutally tough in the Dakotas in the early ’80s. The rest of the US was slowly recovering from a recession; it’d be hard to call what happened on the Plains anything less than a depression. What the foreclosure crisis is to the inner city today, the farm crisis of the ’80s was to the Great Plains. The book that turned his head at an early age was ”The International Jew: The World’s Foremost Problem,” and it was written by Henry Ford. It is based on a 1918 treatise called ”The Protocols of the Elders of Zion,” which purported to be the minutes of a cabal of Russian Jews plotting to destroy Christianity and the white race and take over the world. Ford wrote ”The International Jew” in 1920, and it was not until 1929 that he finally conceded that ”The Protocols” was a fabrication concocted by czarist Russian anti-Semites. Even so, as a young man in the 1940’s, Mr. Kahl believed it totally. He had considerable encouragement. He came of age at a time when the velvet voice of the Rev. Charles Coughlin, a Roman Catholic priest who reached into almost as many homes with his weekly radio show as Fred Allen, broadcast some of the nastiest anti-Semitic propaganda ever heard on the airwaves; when Gerald L. K. Smith established the Jew-baiting Christian Nationalist Crusade in Arkansas and gained a national following, and when Gerald Winrod, an apocalyptic fundamentalist preacher in central Kansas gained tens of thousands of adherents to a movement that came to be known as the Jayhawk Nazis. Winrod’s son, George Gordon Winrod, kept the ministry alive. I remember his followers leaving corrosively anti-semitic leaflets under the windshield wipers of cars in the church parking lot when I was in ninth grade. Nobody in my circle bought into it, of course – but we all knew people for whom it rang true. There was an audience, out there. When Mr. Kahl came home from World War II, he was 25 years old, and he was regarded as a hero. He had shot down 10 enemy planes as a turret gunner on B-25’s, and he had won the Silver Star, the Bronze Star, two air medals, a Presidential unit citation and two Purple Hearts. That was not all the metal he brought home. Surgeons never did get out all the shrapnel he took in the jaw, chest and hip. So the combination of hard times and ready scapegoats found some adherents. Kahl escaped that day; with two federal agents dead, the federal law-enforcement machinery sprung into place. Two blocks from the house where my father still lives in Jamestown, in Stutsman County’s then-brand-new courthouse, the FBI and an alphabet soup of other federal law-enforcement agencies set up their command post; local hotels were jammed with brusque men and women in sharp suits and/or, occasionally, battledress utilities. And they were not happy. Rumors began to circulate; the Feds were tramping about the prairie with big, nasty boots; they were conducting no-knock raids, presuming the locals guilty until proven innocent, acting like a hostile occupying power – or so said the rumors. The previous summer, I’d worked at KDAK, a little station in Carrington, a town of about 2,000 about 40 miles north of Jamestown. The station had also just hired a new “News Director”, a pretty mid-20-something named Peggy Polreis who’d just come from Carrington’s newspaper. One of my jobs had been to make her broadcast-worthy. I did a good job. One day, a few days after the shootout, Peggy got a tip from a source that the Feds were going to search a farmhouse near nearby Fessenden. She arrived on the scene to find that the press were being cordoned away from a farmhouse located a solid half-mile up the road, behind a shelter belt. Peggy slipped away from the group, and crawled – so the story went – a quarter of a mile along the shelter belt, keeping out of sight of the cops. She was, apparently, the only non-cop to see what happened. …to discover the farmhouse empty. It was one of many incidents that angered, and occasionally alienated, the locals from the Feds. How you look at the events of that winter (and the ensuing spring and summer, when the manhunt for Kahl led to a final shootout in Arkansas that left Kahl and another Christian Identity supporter dead) depends on who, and where, you were back then. If you were a local, you knew that North Dakotans tend to be good, law-abiding people; they’ve voted Republican in pretty much every Presidential election since statehood, making them marginally less conservative than Utah. And yet the Posse, and Christian Identity, found recruits and adherents – and it was no mystery why. Radical fringes were no stranger to the plains; the Non-Partisan League, the Grangers, the Bund and other fevered activists had gestated in the area in response to other crises since the 1890’s. So we weren’t surprised that some of the locals were sympathetic. It was a minority – a small one – but it drew attention. One of them even wrote and recorded – on a home cassette player, I think – a song praising and rooting for Kahl, during the manhunt and before the final fatal shootout in Arkansas. It got a little play – mostly from news organizations who were reporting on the acceptance Kahl, the Posse and other extremists got from the area. If you weren’t from the area, and didn’t understand it, it must have seemed odd. And maybe a little scary. Hollywood certainly knows nothing of the area, and understands less about it. But that didn’t stop it from making a made-for-TV movie, based rather loosely on Bitter Harvest, in 1991. Line of Duty: Manhunt in the Dakotas starred Rod Steiger as Kahl, and Michael “Family Ties” Gross as an FBI agent from New York who flew to the state to help solve the crime. The show got the basic facts right; the names, the places (most of the show was putatively set in Jamestown), the timeline (sort of). But the Hollywood take on the area, and the locals, was bemusingly warped. Part of it was the Central Casting version of small-town people; although North Dakota is a place where you can hear the Fargo accent (“Yah, sure, you betcha”) in a hundred little main street cafes and bars, the show had the local farmers speaking with cornpone Arklahoma drawls. The locals, to Hollywood, were out of Gomer Pyle or, given the sinistry of the subject matter, maybe Deliverance. Worse? While there was support for Kahl (and even more criticism of the Feds’ heavy-handedness, arrogance, and occasional contempt for due process in the way they carried out the manhunt in the immediate wake of the shootout), Manhunt in the Dakotas showed something that was almost an active guerilla movement, with rocks and shots aimed at passing police cars, threats, Gross (and Larry Hunt as “Chief Walters”, a composite and sympathetic Jamestown police chief) being harrassed while driving in the countryside, and – in the movie’s climactic scene – the two walking, nervous, down “Jamestown”‘s main street as the “local radio station” played the pro-Kahl song (with a cheery intro from the DJ), both of them keenly aware of the hateful gazes of the locals (by now all of them seemingly Kahl-sympathizers) boring through them both, as if they were fully-bedsheeted Klansmen scurrying through Compton. It was crap, of course, factually (no station in the state played the song, except as news) as well as socially (Jamestown is a college town of 16,000 that hosts a state hospital, and a school for the profoundly disabled, where Kahl had little traction; Kahl’s base of support was out on the isolated drift prairie). But it was interesting, seeing how inscrutable “flyover land” was to the people who actually produce these things, and the almost-superstitious fear the place engenders. That part of North Dakota is a huge place in terms of the land and the sky; the human geography is much smaller. In the 22-odd years since I left the place, whenever I meet other expats, it’s hard to go more than thirty seconds without finding a common acquaintance. It’s the same with events. Besides Dr. Kostick, and Peggy Polreis, I knew Darrell Graf – Medina’s police chief at the time (and Graf has actually turned up on this blog) and people in his family. Scott Kopp was another – a guy I remember as a Stutsman County deputy who lost a finger from a Kahl shot that could have done much worse. Another guy – a Medina cop who was on the periphery of the action – was my friend’s sister’s boyfriend (and, the last I checked, husband of about twenty years). The internet can make you acquainted with even more people. Scott Faul – one of the Posse members who was arrested, tried and did prison time for his role in the shootout – has a blog. Twenty five years is a long time, even out there. But memories are longer still. This entry was posted in Crime and Punishment, Favorites - Culture, Great Plains and Midwest by Mitch Berg. Bookmark the permalink. Is the picture you posted from that day? February 13 in North Dakota, and no snow on the ground? I remember the winter of 82-83 being brutally cold and snowy (at least in the Twin Cities). I remember the day (quite possibly wrongly) being relatively mild. I noticed the lack of snow, too. It’s not that unusual in North Dakota for the wind to clear the snow out of the open areas and pile it up at any obstacle or in any depression it hits. It’s not unusual to see fields with only a dusting of snow, and then several feet of it piled up against a barn or shelter belt or overpass. I was a youngster then but remember the Posse Comitatus from Shawano/Tigerton Wisconsin. Scary group. Anti-gov’t far right wingers. And farming was tough. Years before ethanol and everything else, it was hard to make a profit. Was it the NFO that was the more militant organization? Dump milk, try to block auctions. Good writeup. I remember that well. And if I recall, in that shootout in Arkansas, the farm house where Kahl was caught on fire, and he was crispified. The Posse attracted anti-tax types as well. Mitch, my uncle was one of the bigwigs in North Dakota for the Non-Partisan League. Uncle Henry was the leftist and atheist in a conservative and religious family. Gee, join the crowd in criticizing Hollywood. They made a movie about the Willmar, Minnesota Great Bank Strike. It was filmed in Quebec. The accents were all wrong. The landscape was all wrong. The Willmar Labor Home, which is in an old residential neighborhood just a few blocks from the downtown, was depicted as being quite a distance out into the countryside, and bearing the sign “Willmar Labour Home”. I took my driving test for my first license at the Willmar Labor Home, so I know precisely what it looks like. Hey, a good Norskie like you should watch “Pathfinder”, which is a real slander against the Norse explorers and settlers. My blood pressure still hasn’t settled down. I can’t even begin to enumerate the errors, deliberate or not in the movie. Watch it and see for yourself. Did you read the book by Schnabel & Graf? You may want to. My daughter is married to a ND farmer and lives between Harvey & Martin. There’s some kind of connection to the Faul’s in that area and that’s how I was even cognizant of the whole incident in the first place. Anyway, that book was pretty good. I would think some other “outlook” other than a journalist’s just may be a good idea…I don’t know. What is a journalist’s take on Ruby Ridge or Waco? I actually first heard Gordon Kahl’s name mentioned by my uncle, who is indeed an anti-Semite. Raging. He was asked to leave our house when he began his “the Jews” lecture once. He apologized and has never brought that subject up again. All by way of explaining that we are not anti-semitic. God asks us to pray for and bless Israel and so I do. However, taking that part out of the equation (and I realize it’s a big part), some of the other issues re Gordon Kahl and the Posse Comitatus are not so cut and dried. Oops, I hit submit before I meant to. I was going to finish that last thought by saying that my daughter’s mother and father-in-law get kind of tired of hearing about their nephew and talking politics with his folks-mostly, I think, because he has done so well, but somewhat because they just don’t care. It’s hard for me to imagine not caring about politics, but it sure must be easier on the blood pressure to be that way! fff to call this off, as Medina was int he heart of forclosure land, and the last thing we needed here was any legal problems. The town is now “deadsville” – you can cross the streets without looking for traffic! The Sheriff that could have come to town (Medina) and showed the public how it was HIS Department that called the FEDs, but NO – I have taken the bnlame for 27 yearsnow and people I htought were friends turned their back on me and hate me to no end. That Sheriff was just replaced after all these years. Hope on his way out, he comes to Meidna and clears this mess up. I do want to take the liberty of setting the record straight on the lack of snow for February one blogger noted – look carefully at the photo, the snow/ice covered lake int he backgro9und. This was an exceptionally warm February day, as I recall a “Chinook wind” ahd come through earlier int eh week and melted lots of snow, it was warm that day then got very, very foggy that evening. There was no snow in the particular ditches on the photo, which was indeed unusual. But that photo is accurate 100% and is from the photo archives, I believe we got this photo form the Jamestown Sun for our book cover or the FBI. Note the lump near the rear tire of the Ram Charger – that is the Medina FD Rescue Squad’s blanket I covered Marshal Cheshire with upon my arrival, as he was DOA. The bl;anket got throuwn by the tire upon his removal by ambulance personnel after crime scene investigation was completed for that part. At any rate, I woud like to visit with you and get your address so I can send you a complimentary book.